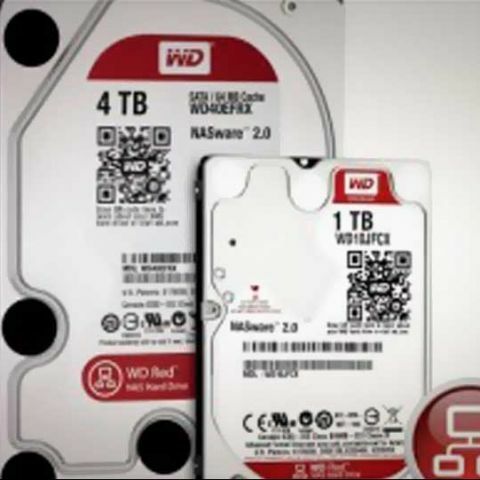 WD has expanded its portfolio with the launch of new 2.5 inch 1 TB Red and 4 TB NAS hard drives. Western Digital has announced the availability of its first 2.5-inch Red line of hard drives, with both a 750GB and a 1TB variety being offered. This comes alongside an expansion of its 3.5-inch form factor drives with model WD40EFRX, offering a larger capacity at 4TB. The WD Red 2.5-inch drives are designed specifically for use with NAS units. According to WD, the Red hard drives offer improved drive reliability and protects customer data in the event of a power loss or disruption. The company states that WD Red hard drives feature 3D Active Balance Plus technology that improves the drive performance and reliability. The new hard drives are powered by NASware 2.0 technology and the WD Red hard drive is compatible with top NAS system manufacturers and is optimized for performance and reduced power consumption. Matt Rutledge, vice president of client storage for WD stated at the launch, “WD defined the NAS drive category by leading the development of hard drives specifically built for small NAS environments. The WD Red product line serves the unique environment of NAS and meets the growing demand for affordable, reliable, and compatible storage." The Western Digital Red hard drives come with a three-year limited warranty and have 24x7 dedicated phone support. The 2.5-inch WD Red 1 TB hard drive is priced at Rs. 6700 (plus local taxes) and the 3.5-inch 4 TB HD is available for Rs. 15,652 (plus local taxes). WD had recently launched the WD Black 4 TB hard drives with 64 MB cache memory, 7200 RPM spin speed, SATA III 6 gigabits per second (Gb/s) interface, dual stage actuator technology, and an integrated dual core processor for Rs 21000 (plus taxes) and a 5 year warranty.